To track consolidation of farmland, ERS researchers use the midpoint acreage or the farm size where half of all acres is on larger farms and half is on smaller farms. Between 1987 and 2012, the midpoints for cropland and harvested cropland roughly doubled—from 650 and 488 acres, respectively—to about 1,200 acres for both. In 2012, there were 38,200 very large crop farms compared to 431,300 midsize crop farms. 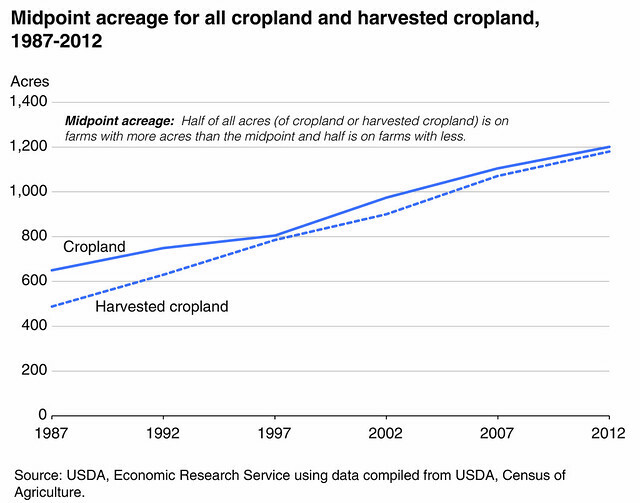 Very large crop farms increased their share of total cropland from 15 percent in 1987 to 36 percent in 2012. Most of this increase came from midsize crop farms, which decreased from 57 percent of total cropland in 1987 to 36 percent in 2012. New technology has allowed a single farmer or farm household to farm more land, contributing to consolidation. To track consolidation of farmland, Economic Research Service (ERS) researchers use the midpoint acreage or the farm size where half of all acres is on larger farms and half is on smaller farms. Between 1987 and 2012, the midpoints for cropland and harvested cropland roughly doubled—from 650 and 488 acres, respectively—to about 1,200 acres for both. Consolidation also occurred for individual crops. 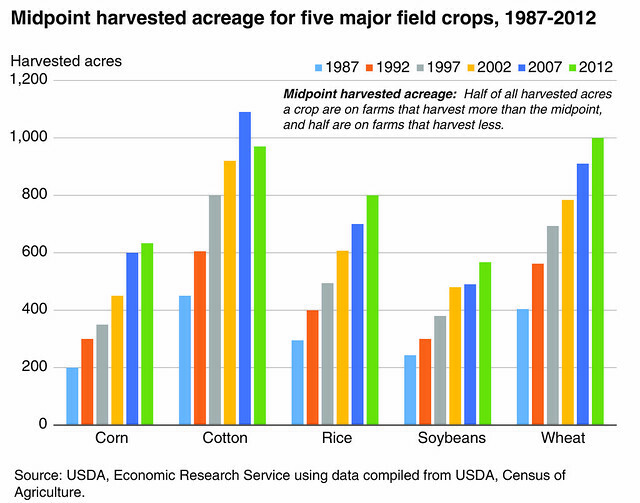 For example, between 1982 and 2012, the midpoint for harvested acreage more than doubled for five major field crops: corn, cotton, rice, soybeans, and wheat. Their midpoints also increased in each 5-year period between Censuses of Agriculture, except for cotton between 2007 and 2012. Altogether, ERS researchers examined the midpoints for 55 crops—the five major field crops discussed above plus 10 additional field crops, 20 fruit/nut/berry crops, and 20 vegetable/melon crops. Results were consistent across crops. Consolidation in crop production was widespread over 1987-2012, with 53 of 55 crops showing increases in acreage midpoints. Consolidation was also substantial, with 40 of the 55 crops at least doubling midpoint values. And consolidation was persistent, with midpoints increasing in most 5-year census periods. However, cropland consolidation slowed after 2007, as the annualized growth in midpoints fell for field crops and for vegetable/melon crops. For more information, please see the March 2018 ERS report Three Decades of Consolidation in U.S. Agriculture and the associated webinar. Between 1982 and 2012, the midpoint for harvested acreage more than doubled for five major field crops: corn, cotton, rice, soybeans, and wheat.